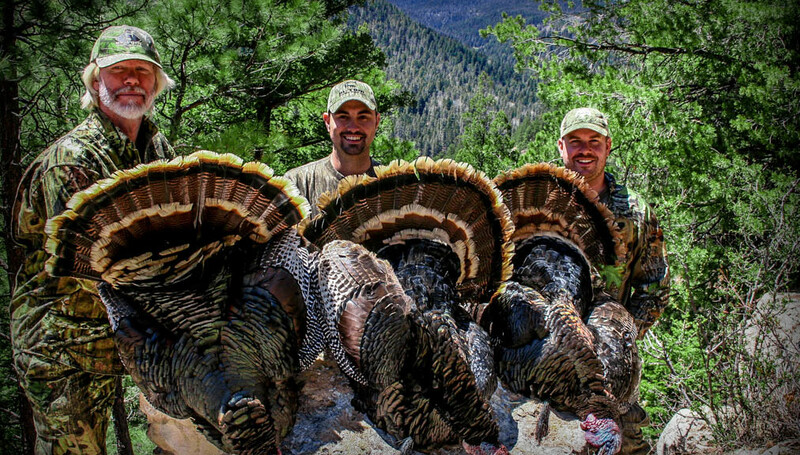 Chat with other hunters about hunting Merriams Turkey! The Merriam’s wild turkey (Meleagris gallopavo merriami) resides in the mountainous region of the western U.S. and numbers more than 334,000 in population. The name was given to the bird by Dr. E.W. Nelson in 1900, who named it after C. Hart Merriam, the first chief biologist of the U.S. Biological Survey. Evidence points to the fact that when the Merriam’s wild turkey was first discovered by the European settlers, it was relatively new in the U.S. 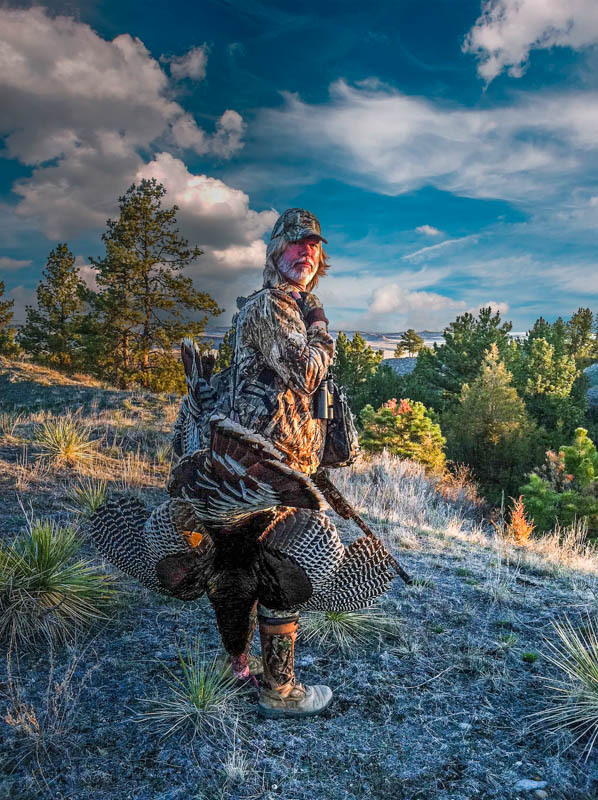 It has remained fairly isolated from other subspecies of wild turkey and was traditionally found only in New Mexico, Arizona, and Colorado, although it now can be found in 15 states and 4 Canadian provinces. The Merriam’s wild turkey is about the same size as its eastern cousin, the eastern wild turkey. However, unlike the eastern turkey, the Merriam’s appears to be more black with iridescent hues of bronze, purple, and blue. The rump of the bird looks to be white as it has white-, pink-, or buff-colored tail tips and coverts. The males tend to be darker, with black-tipped breast feathers. In contrast, the females have buff-tipped breast feathers. The females tend to have more white feathers on their wings and, while they do not have the fleshy caruncles and other such growths around their neck, they do show more head color than females of other subspecies. The males do have red caruncles, snoods, and dewlaps around their neck and head. They also have a beard and spurs on their lower legs. About 10% of females have a beard, although it is shorter than that of the male, and if they have spurs, then these spurs are underdeveloped. 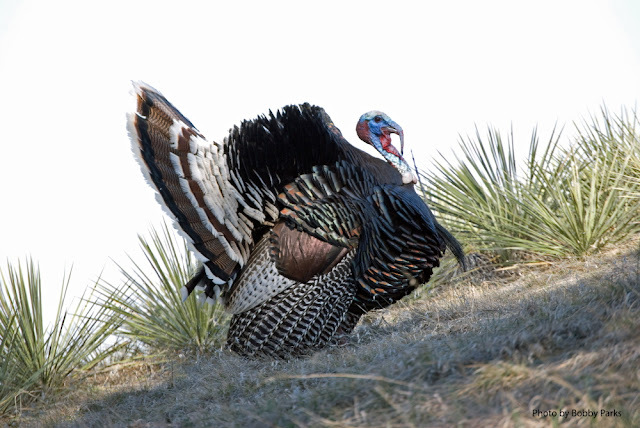 The Merriam’s wild turkey lives in the Rocky Mountains. They tend to spend the summers in the higher elevations, which is where they breed, and then they move into the foothills for the winter months. Distances moved can be 40 miles or more and will vary from year to year, depending on the amount of snowfall and winter conditions. Movement to higher elevations for the summer months occurs between mid-March and mid-April. During the winter, when they move to the foothills, the Merriam’s live amongst ponderosa pines and pinyon-juniper woodlands. If they must move below the conifer line, then they will roost in cottonwoods and may have to rely on food found near human habitation. Rather than being territorial, Merriam’s wild turkeys have home ranges, large areas of land over which they range. Their diet consists of plants and insects. Juveniles will eat a high percentage of insects and as they grow into mature turkeys their diet becomes predominantly plant-based, only 10% of it consisting of insects. The plant material they eat includes grass, vines, nuts, seeds, and berries. When the necessity arises and Merriam’s turkeys will eat grains, such as rye, oats, and barley, that they find when driven down into human habitat. As with the other subspecies of wild turkeys, the Merriam’s wild turkey has keen eyesight and excellent hearing, which means that it is a challenge for hunters to catch these elusive birds. It is important for hunters to become familiar with the behavior of the birds and their many different calls. The Merriam’s wild turkey, as the other wild turkeys, have 28 different calls that each have a distinct meaning. The hunter can lure a male turkey by imitating the call of the hen. The Merriam’s wild turkey will begin mating as the warmer, longer days of spring arrive. There is a pecking order amongst both the males and the females and when mating season arrives, the males will attempt to attract females by strutting about and gobbling. These acts also serve to intimidate other males. The female will lay between 10 and 12 eggs over a two week period and they will hatch after 26-28 days.